Your opinion matters. Leave your review of Shelter Services Tanner House. Description: men's and women's shelter. 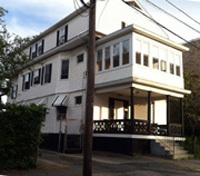 Tanner House is located on Tanner Street, off Prairie Avenue, in South Providence, within walking distance of downtown Providence and near several bus lines. Many men and women have passed through its doors and found a path from the homelessness they had experienced to a more permanent housing situation. For a modest rental payment for their housing and a willingness to change, they have found an opportunity to examine their lives and develop goals for themselves. Ten single adults, along with a live-in house manager, live at Tanner House. Each resident enjoys a private bedroom. Common areas, such as bathrooms, living rooms, two kitchens, two porches, a finished basement with exercise equipment, and a fenced-in yard are part of their living arrangements. free lifestyle, employment and improved coping skills. The use of alcohol or drugs is strictly prohibited and is grounds for discharge from the house. Do you have items to donate? Contact Shelter Services Tanner House at the phone number provided above to see if they can use any items you may have to donate.